SecuriDex is the PUP that uses misleading techniques to prevent removal. Use Reimage to locate malicious components and get rid of them faster than with uninstall instructions. A full system scan blocks virus reappearance and prevents traffic to malicious domains. How does SecuriDex hijack PCs? Do not try to close these ads – more of them are going to show up eventually. The only way to stop them is to remove SecuriDex PUP from the computer. You can uninstall it from your system with a help of anti-spyware software, for example, SpyHunter. SecuriDex PUP spreads via freeware and shareware, so be attentive whenever you download and set up new software on your computer system. PUPs are usually added to other well-known free programs and presented as “optional downloads.” Sadly, the majority of computer users still do not how to install software properly. PUPs usually travel in software packs, and users need to decompose such packs before installing them. Avoid installing “recommended downloads,” because these usually appear to be various ad-supported programs, such as adware or browser hijackers. To keep your computer safe, choose Advanced/Custom settings when installing new software. Either one or another option expands the configuration window and provides a list of software’s components. You have to review them and opt out all optional applications, such as browser add-ons, toolbars, or questionable apps. If you feel like you are experienced enough to uninstall this adware program by yourself, follow SecuriDex Player uninstall instructions given below. In case you wish to uninstall it automatically and protect your computer from spyware and malware computer infections, consider installing a reputable anti-spyware software. Here, look for SecuriDex or any other recently installed suspicious programs. Wait until you see Applications folder and look for SecuriDex or any other suspicious programs on it. Now right click on every of such entries and select Move to Trash. When in the new window, check Delete personal settings and select Reset again to complete SecuriDex removal. Once these steps are finished, SecuriDex should be removed from your Microsoft Edge browser. Here, select SecuriDex and other questionable plugins. Click Remove to delete these entries. Now you will see Reset Firefox to its default state message with Reset Firefox button. Click this button for several times and complete SecuriDex removal. Here, select SecuriDex and other malicious plugins and select trash icon to delete these entries. Click Reset to confirm this action and complete SecuriDex removal. 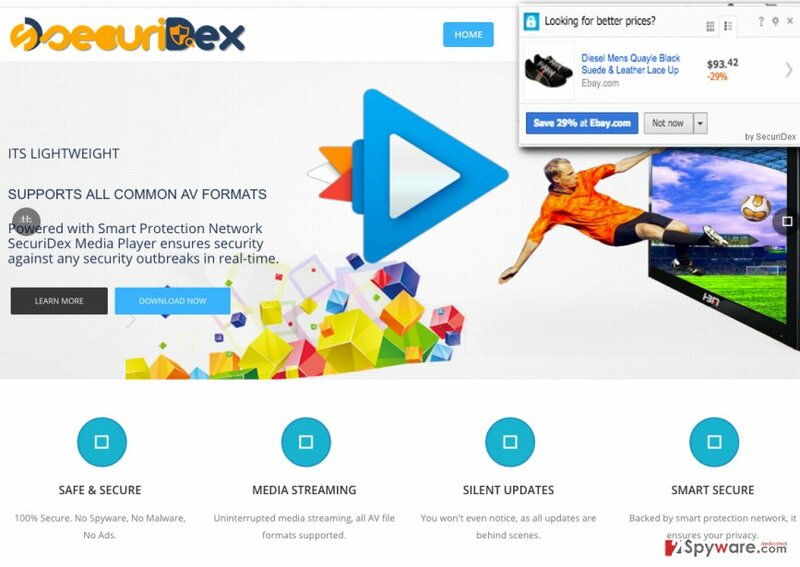 Here, select Extensions and look for SecuriDex or other suspicious entries. Click on the Uninstall button to get rid each of them. Now you will see a detailed dialog window filled with reset options. All of those options are usually checked, but you can specify which of them you want to reset. Click the Reset button to complete SecuriDex removal process. This entry was posted on 2016-04-07 at 23:50 and is filed under Adware, Viruses. You can quickly scan the QR code with your mobile device and have SecuriDex manual removal instructions right in your pocket. How did you remove SecuriDex?